VGB compliant suctions circulate the water back for a continuous swim. An 18-inch propeller funnels water through louvers and out a 2-foot opening that creates a current throughout the swim spa, not just in a center lane. The variable speed current can be set from 0 to 4,000 gallons per minute! The Swimmer's Edge 18 from Premium Leisure offers what many swimmers have called the best swim experience in any portable swim spa. It is the only model that utilizes RipTide Manchine technology a variable speed, hydraulic-driven stainless steel turbine power system. 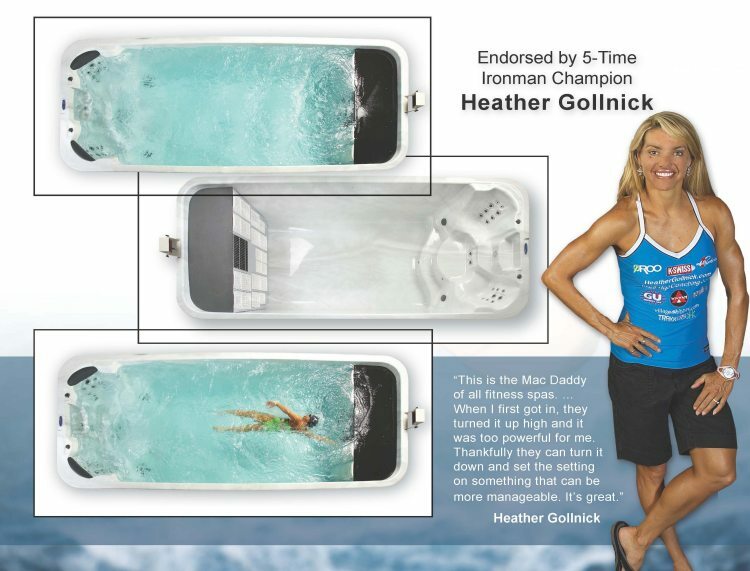 This 7.5 HP standalone wellness retreat comes with a floating remote control that allows the swimmer to create a continuous wave throughout an extra wide swim lane. Set the unit between 50 and 999 and enjoy the same workout every time. Scroll down for full specifications.